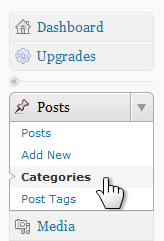 How do I get rid of “Uncategorized” on my WordPress blog posts? WordPress posts are identified with categories and tags to make it easier for readers to find related information. These labels are shown above or below posts and can be shown in sidebar “widgets”. 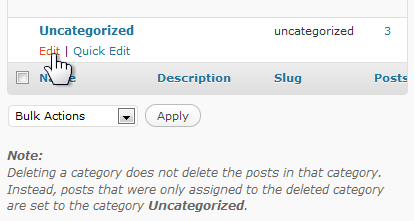 The default category is “Uncategorized”. A default category, the one used if you do not make a specific assignment, is required, but it need not be named “Uncategorized”. You can change it to another term. I use “General”. Open your WordPress Dashboard. On the left click Posts to expand that menu. Click Categories. The categories are shown in a pane on the right. Find the Uncategorized listing in the table. Option links become visible when you move pointer to just below the category name. Click Edit. On the Edit Category page you can change the name of the category. Edit out the current name and type in the term you prefer. In all places where the term Uncategorized used to appear, the new term will now be displayed.